Edited by #1 New York Times bestselling author David Baldacci and including stories by Michael Connelly, Lee Child, Jeffery Deaver and more, this one-of-a-kind anthology pulls together the most beloved characters from the best and most popular thriller series today. Worlds collide! 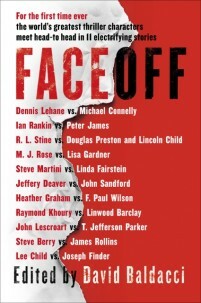 So sit back and prepare for a rollicking ride as your favorite characters go head-to-head with some worthy opponents in FaceOff – it’s a thrill-a-minute read. "A marvelous anthology. This innovative concept entertains as each author works in concert with another to deliver a story worth every word on the page." "A thriller reader’s ultimate fantasy. How cool would it be if a pair of celebrated crime-fiction protagonists, the creations of different authors, teamed up together on a case, in a story jointly penned by the two writers? Even if it was just 1 pair, it would be pretty darn cool, but 11 pairs? Way cool. . . Great fun for thriller fans." "So good it demands a sequel."